Allan Fung has won the Republican nomination for Rhode Island governor. The win gives Fung, the mayor of Cranston, a second chance at the office he failed to win four years ago in a contest against Democratic Gov. Gina Raimondo. Fung beat Patricia Morgan, a state lawmaker. Fung has given few interviews, held no press conferences and said little about his views during the race. He agreed to a single debate on a small radio station. Fung says he wants to cut the sales tax from 7 percent to 5 percent, but he hasn’t put forward a detailed plan to pay for it. In 2014, he lost to Raimondo in a three-way race, with 36 percent to Raimondo’s 41 percent. Rhode Island Gov. Gina Raimondo has won the Democratic nomination for a second term, fending off a challenge from the left by former Secretary of State Matt Brown. Raimondo has been running on her record of job creation and an improving economy, as well as her work to repair crumbling schools and roads and a free college tuition program she started. Brown had tried to paint Raimondo as too close to corporate interests and blasted her for her copious fundraising. She has raised $7.6 million for her re-election bid in a state with just 1 million residents and a single media market. Republican Patrick Donovan has won his party’s nomination to challenge Democratic U.S. Rep. David Cicilline in November. Donovan, a stay-at-home father, beat accountant Frederick Wysocki in Wednesday’s primary. Cicilline is seeking his fifth term in Congress. He represents the 1st Congressional District, covering the easternmost part of the state. Donovan says he’s running because he wants district residents to have a representative more attuned to their needs. He says the way prescription drugs are disposed of needs to change to protect the environment and prevent misuse. He says he’d work to lower the price of prescription drugs and pursue purchasing power from Hydro Quebec. Cicilline has a rising profile in the national Democratic party. He’s outspoken in his criticism of the president on topics such as immigration and Russia. U.S. Rep. David Cicilline has cruised to a win in the Democratic primary in Rhode Island. His only opposition in Wednesday’s primary was from perennial candidate Chris Young, who has run unsuccessfully for various offices. Cicilline is seeking his fifth term in Congress. He represents the 1st Congressional District, covering the easternmost part of the state. He’ll face the winner of Wednesday’s Republican primary in November. Cicilline has a rising profile in the national party. He’s outspoken in his criticism of Republican President Donald Trump on topics such as immigration and Russia. The 57-year-old is a former Providence mayor. He says if re-elected, he would continue to protect Social Security and Medicare. He says he’d push for legislation to reinvigorate the manufacturing sector, invest in infrastructure and address gun violence. Former Rhode Island Supreme Court Justice Robert Flanders has won the Republican U.S. Senate primary in Rhode Island and will face Democratic incumbent Sen. Sheldon Whitehouse in November. Flanders on Wednesday beat California businessman Roque “Rocky” De La Fuente, who was running for Senate in numerous states. Flanders retired from the high court in 2004. His highest profile position since then was his appointment as receiver in the city of Central Falls in 2011 when it declared bankruptcy. The 62-year-old Whitehouse is one of the leading voices in the Senate to do more to address climate change. He has also been harshly critical of President Donald Trump. The 69-year-old Flanders has said he voted for Trump but that he would not reflexively back him. He has called Whitehouse “silver spoon Sheldon” and criticized his focus on climate change. U.S. Sen. Sheldon Whitehouse of Rhode Island has beaten back a Democratic primary challenge in his bid for a third term. Whitehouse defeated Patricia Fontes in Wednesday’s primary election. The 62-year-old Whitehouse is a leading voice in the Senate pushing to do more to address climate change. He has also been critical of President Donald Trump on a number of issues, including by pushing to protect special counsel Robert Mueller’s Russia investigation. The 81-year-old Fontes is a retired educator and peace and environmental activist. She has said Whitehouse’s votes in the Senate “facilitate continual war,” including his vote against a resolution to pull American troops from Yemen. Polls have closed in Rhode Island, and U.S. Rep. James Langevin and his Republican opponent have sailed through unopposed. Langevin is seeking a 10th term to represent the 2nd Congressional District in western Rhode Island. He did not face a Democratic challenger in Wednesday’s primary. He’ll face Republican businessman Salvatore Caiozzo in November. Caiozzo, also unopposed, ran for the seat in 2016 as an independent, finishing last. Langevin says his top priority has been fighting to put Rhode Islanders back to work by standing up for small businesses and taxpayers and building a strong new foundation for the American economy. The state’s workforce was hit hard by the recession and a decades-long manufacturing decline. Langevin is a former Rhode Island secretary of state who was first elected to Congress in 2000. He’s a senior member of the influential House Armed Services Committee. Voters also were selecting nominees for the 1st Congressional District, U.S. Senate, governor, lieutenant governor, attorney general and some key mayoral races. Voters are going to the polls to select nominees for Rhode Island governor, U.S. Senate, U.S. House, lieutenant governor and some key mayoral races. The Providence Journal reports some started early Wednesday in Providence at a local elementary school. Asha Misra told the newspaper she voted for Gov. Gina Raimondo because she believes the incumbent puts the state’s needs ahead of her own ambitions. Raimondo faces former Secretary of State Matt Brown in the Democratic race. Tara Nummedal and her husband, Seth Rockman, voted for Brown. Nummedal said she believes Brown’s policies for women are better than his opponent’s. One race to watch is the Democratic primary for lieutenant governor, which pits incumbent Dan McKee against self-described progressive state lawmaker Aaron Regunberg (RAY’-gun-berg). Polls close at 8 p.m.
Rhode Island’s Democratic governor faces a spirited but poorly funded challenge in the primary, while the mayor of the state’s second-largest city is seeking the GOP nomination for another shot at the governor’s seat in November. First, he has to defeat a state lawmaker making her first gubernatorial run. Voters in Rhode Island on Wednesday are also selecting nominees for U.S. Senate, U.S. House, lieutenant governor and some key mayoral races. Gov. 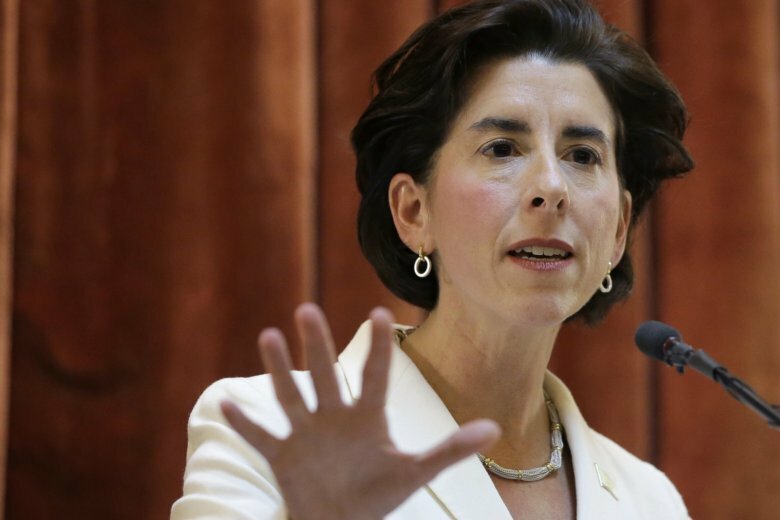 Gina Raimondo faces former Secretary of State Matt Brown in the Democratic race. The winner is expected to go on to face either Cranston Mayor Allan Fung or House Minority Leader Patricia Morgan. Polls close at 8 p.m. Wednesday.